The crowd enjoys opening night at the Tossed and Found show at Salt Spring Gallery. 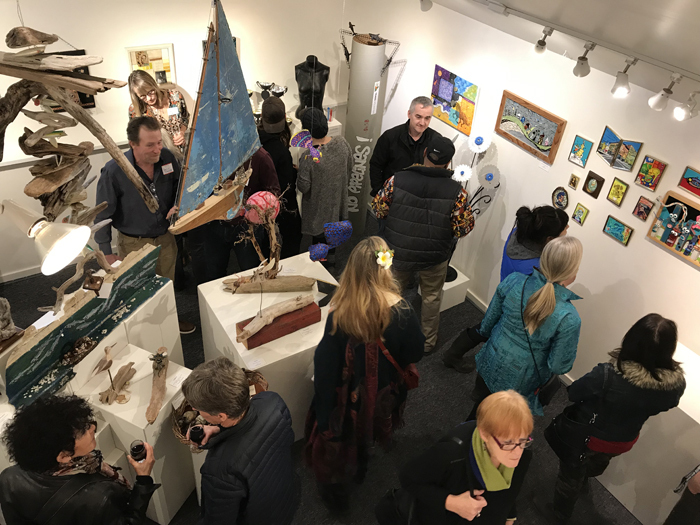 The fourth annual show of art made from found and recycled materials has washed up to rest at the back room at Salt Spring Gallery, and once again the artists involved have brought admirable creativity and innovation to their treatment of the theme. Tossed and Found has a natural connection to the sea, as many of the found materials on an island happen to arrive via the water. There are therefore a number of pieces that take driftwood and plastic scraps from the beach and transform them into ocean-based art to good effect, such as a hanging model sailboat by Tracey Cobane and a kinetic mobile by Cinda Helm. Driftwood and other beach finds also make their way into non-ocean based art. Marianne Campbell capitalizes on wood’s rough texture and shape for the delightful sculpture Run Spot Run, with a quirky dog figure born from a piece of flaking white-painted wood, embellished with a rusty hinge ear and other scraps. Gary Beckett has a chunky wooden perch for his stained glass owl, all made from materials found at Willows Beach. Marek Munroe, a young artist who was raised and homeschooled aboard a boat, contributes three Flying Fish papier mâché sculptures made from recycled materials. The colourful and creative figures represent the artist’s love of nature and his awareness of an ocean ecosystem at risk of being overwhelmed by garbage. Non-beach finds are just as inspiring, of course, and many of the works this year make good use of metal scraps. Nycki Samuels has a lovely series of tall standing Blue Steel Flowers sculptures, elegant with curving stems and wrought leaves. Some of the flowers make use of old golf club heads for their meaty petals. Peter Allan’s Improvisations in Black takes inspiration from the found art of Louise Nevelson and graphic words by Jenny Holzer. A small female manikin torso painted black is covered with activism hashtags, and includes a pencil as a way of encouraging viewers to take action beyond the keyboard and social media. A second element is a set of Gratitude Trophies – painted matte black on their outer surface but with their inner cups left shiny gold. The trophies are labelled with admirable social roles like firefighters and teachers, but also more the personal heroes including friends, family and pets. Artists who combine a variety of found materials together to interesting effect include Braven Rayne, whose Space Junk is an assemblage of metal items with a circular shape of centre, such as saw blades and sander disks, all in a variety of shades from shiny silver to full gritty rust. This earthy galaxy is set on an irregular slab of plywood that complements the other tones well. With many other artists and works of equally interesting nature to discover, this is the type of show you might want to see twice to take it all in. It continues to March 27.